KOPIE, Eleanor Patricia (nee Boldizar) - passed away peacefully in Greenwood, IN, on April 2, 2019 at the age of 92 with family at her side. Born on April 7, 1926 in Eleanora, PA, she worked as photographer’s assistant, where she mastered the hand-coloring of sepia toned photographs. She also worked in US Steel’s Homestead Works as part of the war effort. 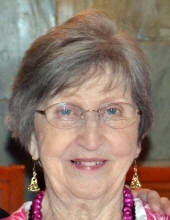 A devout Catholic, Eleanor was active in various ministries in the Saint Ferdinand parish of Cranberry Township, where she was a member from 1974 through 2016. Eleanor was preceded in death by her devoted husband of 50 years, William Francis, whom she married on May 23, 1947. She is survived by five loving children, Susan Dalrymple of Easley, SC, William David (Linda) of Utica, NY, Marianne Liggett (Daniel) of Venice, CA, John (Cyndie) of Greenwood, IN, and Jeffrey of New York, NY, as well as six grandchildren, three great-grandchildren and countless other relatives and friends. She will be fiercely missed for her humor, compassion and generosity of spirit. Friends and family will be received on Tuesday, April 9, 2019 from 6:00-8:00 p.m. at the Boylan-Glenn-Kildoo Funeral Home, Inc., 130 Wisconsin Avenue, Cranberry Twp., PA 16066. Funeral mass will be celebrated at 10:00 am on Wednesday, April 10, 2019 at St. Ferdinand Catholic Church, 2535 Rochester Road, Cranberry Twp., PA 16066, with internment immediately following at St. Gregory’s Cemetery, 503 S. Oliver Avenue, Zelienople, PA 16063. In lieu of flowers, the family requests that donations be made to Pink Heart Rescue of Indianapolis (squareup.com/store/pinkheartrescue) or to another charity of the donor’s choosing in Eleanor’s name. To send flowers or a remembrance gift to the family of Eleanor Patricia Boldizar Kopie, please visit our Tribute Store. "Email Address" would like to share the life celebration of Eleanor Patricia Boldizar Kopie. Click on the "link" to go to share a favorite memory or leave a condolence message for the family.